Entries are now closed for our Ultimate Bali competition. Thank you for everybody that entered! We have had some awesome submissions. Winners will be announced on March 5th 2019! 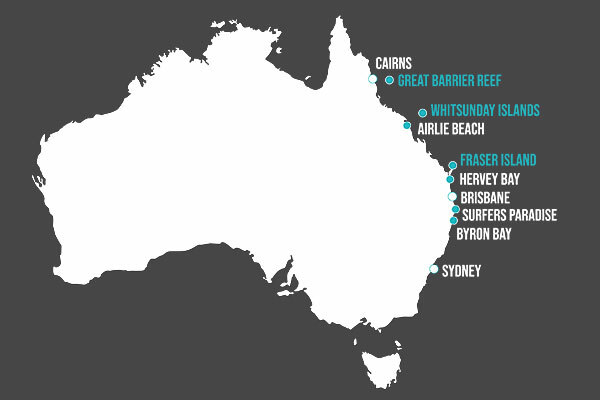 The Ultimate East Coast Highlights tour takes us from Sydney to Cairns over 30 days. 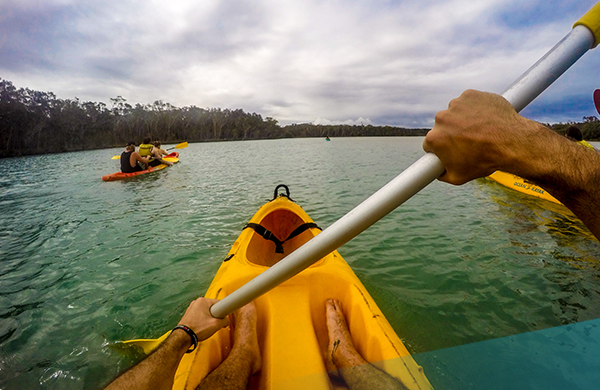 We’ll explore Fraser Island, sail around the Whitsunday Islands, Snorkel on the Great Barrier Reef, Kayak with dolphins, visit world famous Australia Zoo and learn to surf in Surfers Paradise! 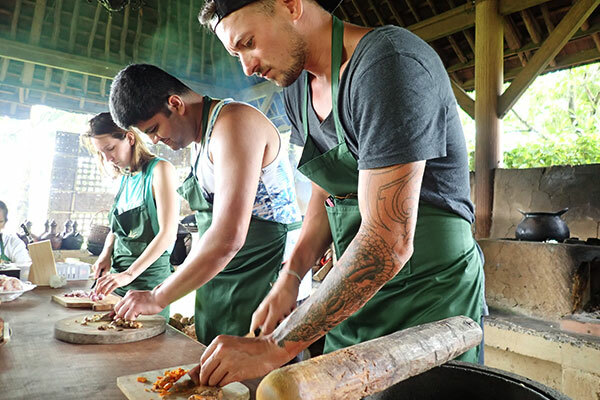 Our local accommodation has been hand selected to offer you a unique experience in Bali. During Ultimate Bali, you’ll be staying in twin share accommodation in centrally located hotels with great facilities. Our accommodation includes a surf inspired hotel, a tucked away jungle resort and an island hotel! Welcome to the land of smiles! When you arrive at the airport our driver will meet you and drive you to our accommodation in the heart of Bangkok right near famous Khao San Road! 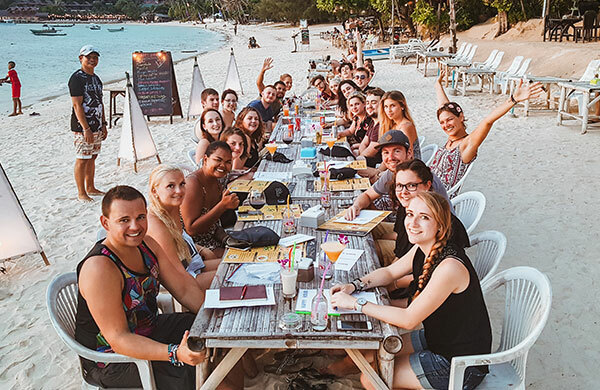 Get settled in then meet the rest of your group and your Ultimate Thailand group leader this evening at our welcome dinner before heading to our favourite Bangkok nightlife spots. Today your tour leader will show you some of the city’s highlights including Bangkok’s magnificent temples, river and markets. 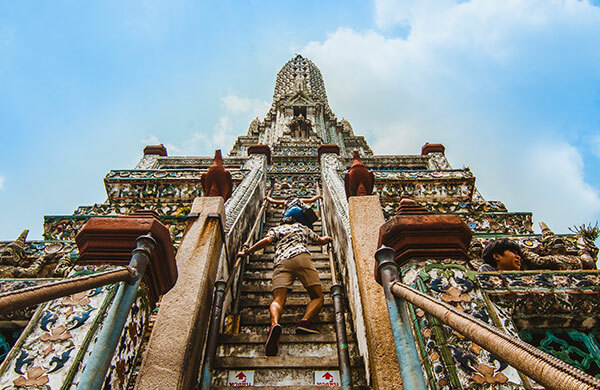 Explore the Dawn Temple ‘Wat Arun’, riverside markets and the amazing Reclining Buddha Temple ‘Wat Pho’. This evening we’ll make the most of Bangkok’s vibrant nightlife with another fun night on the town! Today we travel to the jungle! Enjoy a morning of relaxing – sleep in, go exploring or head to Bangkok’s famous floating markets. That evening we’ll catch the overnight train to Southern Thailand; grab some dinner and get settled into your comfy bed on the train waking up refreshed and ready to explore Khao Sok National Park. Today we travel by longtail boat to our jungle getaway hidden deep in the rainforest of Khao Sok National Park where we’ll be staying in floating rafthouses. Grab a kayak, swim in the lake, chill on the pontoon and take in your amazing surroundings! This evening we’ll get together for a tasty Thai dinner with fish caught for us fresh from the lake. 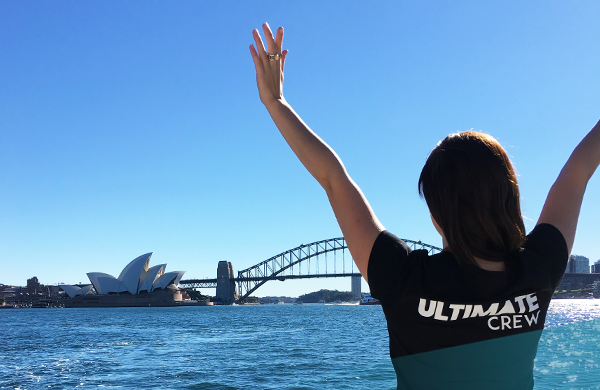 Share your awesome travel moments with us on Instagram and be in with the chance of winning $100 off your next Ultimate tour! We will pick our favourite pic every month, repost the winning pic & send the winner a $100 off promo code! 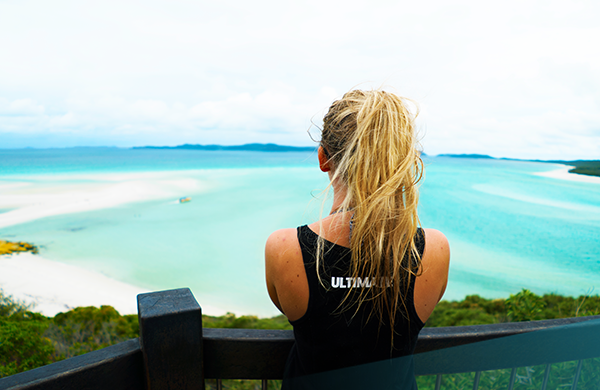 Tag your Ultimate travel moment today! Wake up in your bamboo rafthouse to the beauty and tranquility of Khao Sok Lake at sunrise before getting ready to explore the jungle! Spot monkeys in the trees and enjoy breakfast on the lake before heading out on a trek through the jungle, stopping off to explore hidden caves (seasonal) and visiting local waterfalls. This afteroon, we’ll travel to our next stop, Khao Sok Jungle Village where we’ll check out our favourite Thai reggae bar for dinner and drinks. 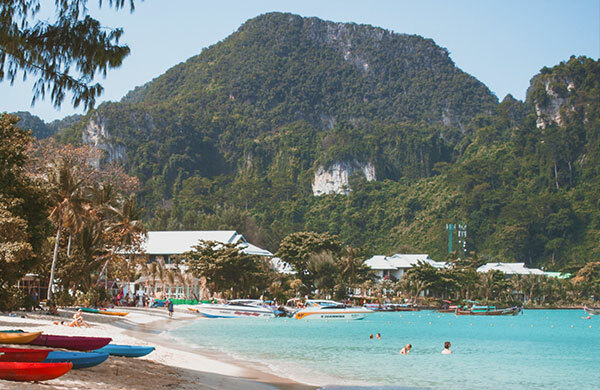 Today we travel south to the beautiful island of Koh Phi Phi for two nights of tropical island fun! We’ll take you to our favourite beach bars and check out the world famous beach fire shows! Koh Phi Phi is known for it’s stunning turquoise waters and colourful marinelife so today we’ll explore the island on a private boat tour! We’ll stop off to swim and snorkel at some of the islands best limestone reef spots. 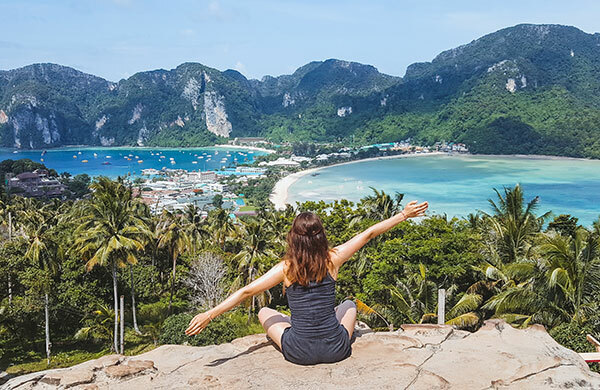 That evening we’ll hike to the famous Koh Phi Phi viewpoint for stunning views of the island at sunset before heading to the beach for dinner, music and drinks. 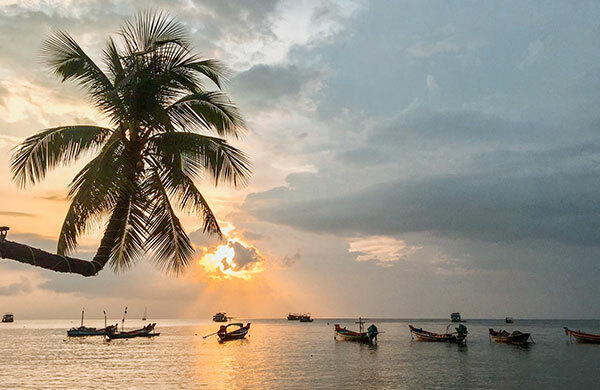 Our next stop is the famous party island of Koh Phangan. Our island accommodation is right near the beach; make the most of relaxing on the beautiful white-sand beaches or check out some of Koh Phangan’s awesome island activities during the day. 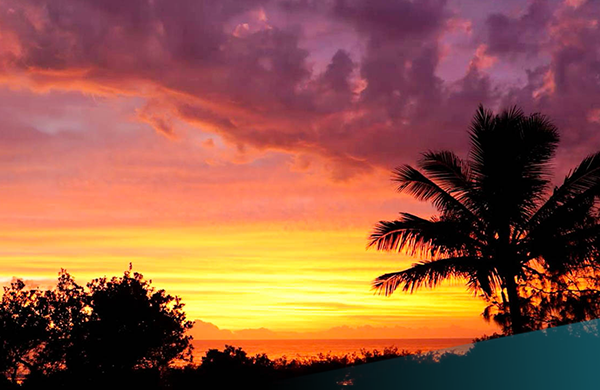 We’ll spend our evenings seeing some amazing sunsets and enjoying the island’s nightlife! Today is yours to spend as you choose. Relax by the pool at your resort, head to the beach for a swim, go kayaking, get a massage or explore Haad Rin on the other side of the island. Your guide can also arrange day activities for you such as Muay Thai boxing, cooking lessons and yoga. This evening we’ll meet up for dinner at one of our favourite island restaurants and enjoy a few cocktails on the beach. This morning you’ll be picked up from our resort in Koh Phangan and taken to Thong Sala Pier where you’ll take a public ferry to Koh Tao. When you arrive, take a local taxi to our Sairee Beach accommodation ready for the a few days in island paradise! 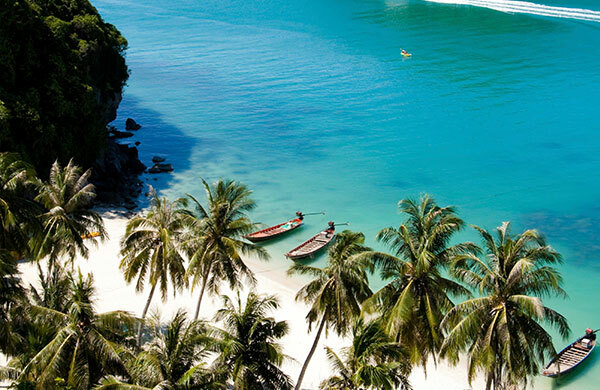 Discover the incredible beaches and coral reefs of the stunning island of Koh Tao on our boat trip of the island. Our trip starts at Ao Luk, a beautiful bay with a sandy beach and beautiful coral – the ideal spot for a swim and some snorkelling! 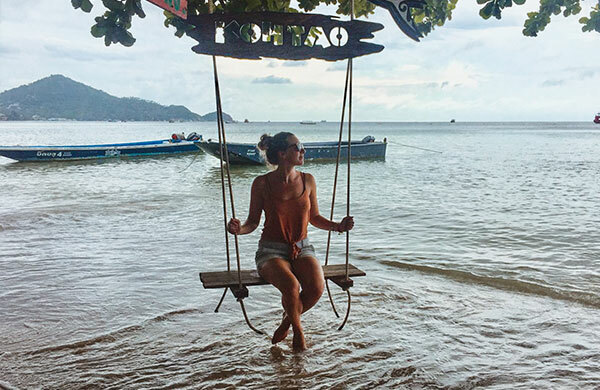 We’ll explore some of Koh Tao’s beautiful bays including Hin Wong Bay and Mango Bay before stopping at Koh Nang Yuan, a small private island paradise off the west coast of Koh Tao. Relax on the white sandy beach or snorkel in the crystal blue water before we return to our accommodation in the late afternoon. Spend this morning at your leisure before a day chilling out on the famous Sairee Beach! The sunsets at this beach are spectacular and the water is the perfect temperature for an evening swim! We check out this morning and make our way to Koh Tao pier to continue our travel to the palm-fringed island of Koh Samui. Today, we’ll explore the island of Koh Samui. Get ready for a day of excitement and entertainment as we explore local waterfalls and take on the jungles of Samui via zip-line cables! This morning, we’ll travel towards the North of the island stopping off at the waterfalls of Namuang. Translating roughly to ‘purple face’, the falls are named after the purple-toned limestone rocks which can be seen behind the cascading water. 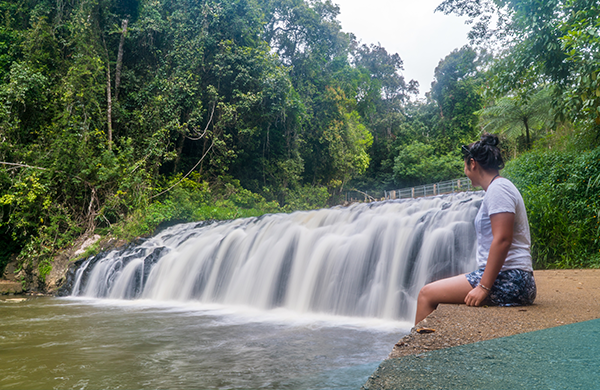 Your guide will point out ‘Namuang 2’ waterfall, which is the largest on the entire island. Next up, it’s time for fun in the jungle with a zip-line experience. There are four routes in total, allowing you to fly across the jungle canopy! Take time to recharge with a Thai-style lunch before returning back to your hostel. Day 16 – Say Farewell to the land of smiles! 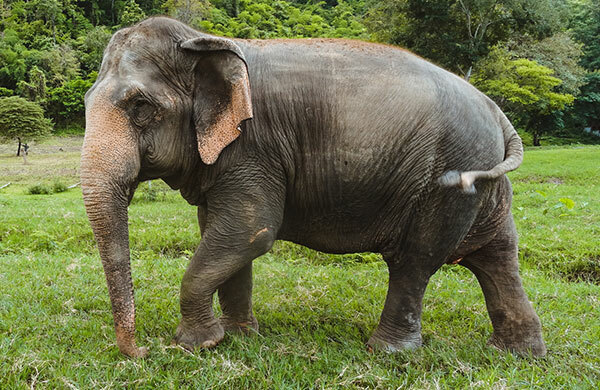 After our amazing 16 day adventure, we’ll help you make arrangements for the next leg of your trip, whether you’re heading back to Bangkok, travelling north to take part in our Chaing Mai Elephant Adventure or elsewhere in Southeast Asia! 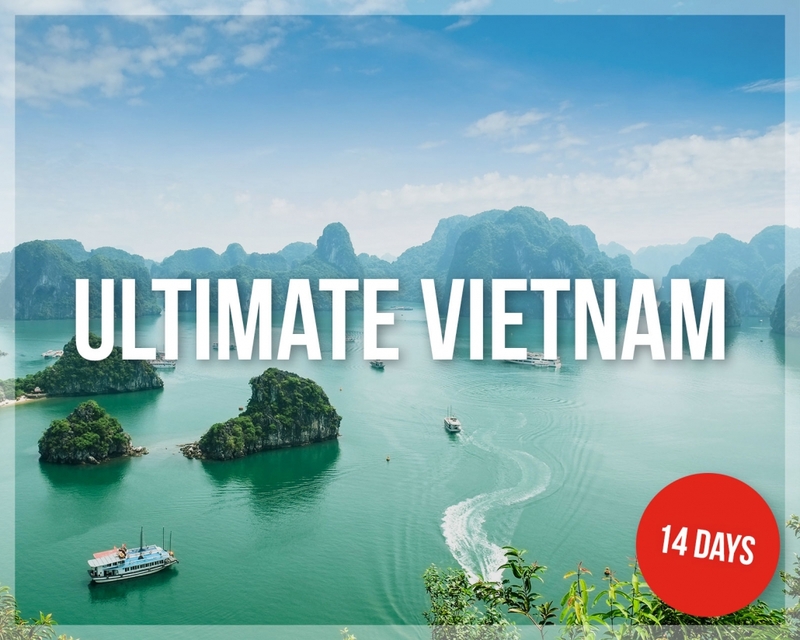 If you’d like to extend your Southeast Asia adventure, join us on another ULTIMATE tour in Bali or Vietnam! Whatever your plans, we’ll make it easy! 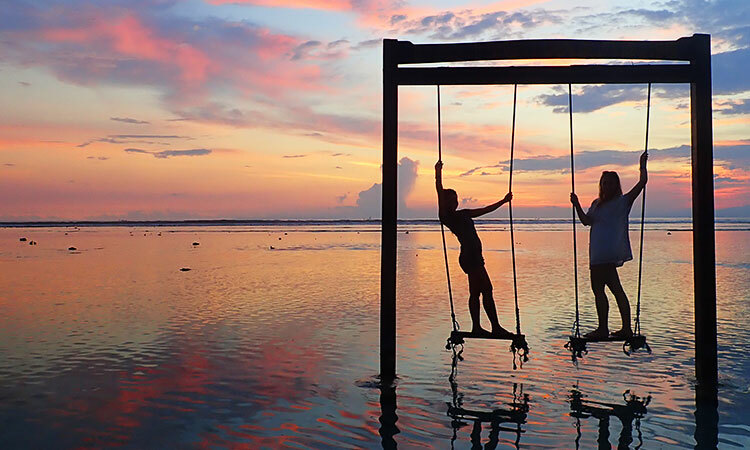 We’ll show you the very best of Bali. 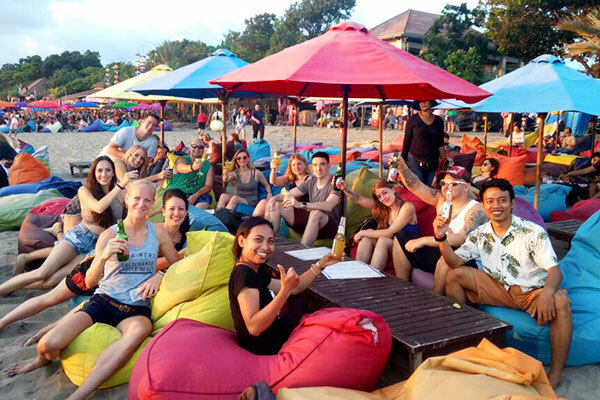 Party in Kuta, visit Balinese temples, learn to surf, swim in waterfalls, walk through stunning rice terraces, learn to cook traditional Balinese dishes, climb to the summit of Mount Batur, spot monkeys in the forest, snorkel around paradise islands and party on the beach in Gili T! We travel the East Coast by premium coach, with comfortable reclining seats, free Wi-Fi, USB chargers and onboard toilets. Our overnight services give us more time in each destination – you’ll arrive rested, refreshed and ready for the next adventure! Ultimate East Coast Tours are fully guided by our awesome tour guides; all fully licensed, first aid trained and available 24/7 whilst on tour! Ultimate East Coast is perfect for travellers who want a set itinerary with the added support of a guide. Get ready for the Ultimate adventure! 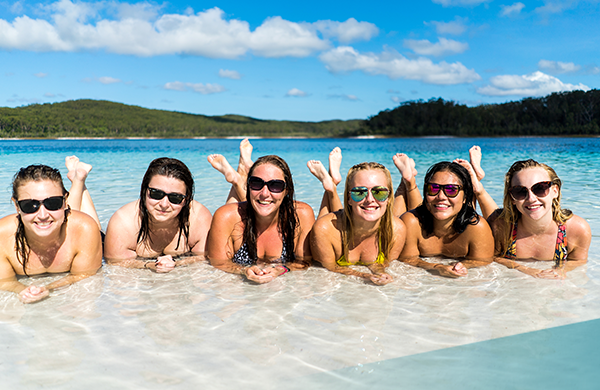 We’ll explore Fraser Island, sail around the Whitsunday Islands, Snorkel on the Great Barrier Reef, Kayak with dolphins, visit world famous Australia Zoo and learn to surf in Surfers Paradise! Want to Explore a bit more of Sydney? Choose our 3 Day/3 Night Sydney add-on. 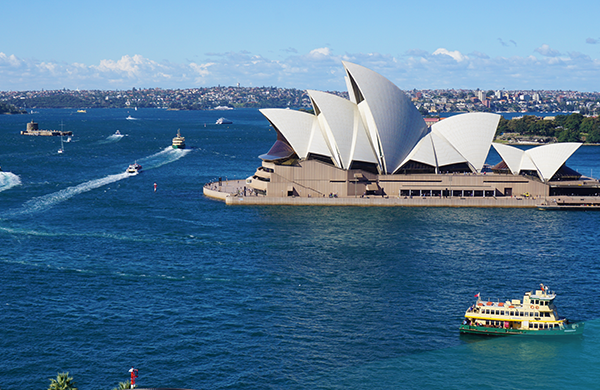 Includes 3 nights accommodation in Sydney, a city explorer tour, welcome dinner and a Harbour cruise! Keen for more after your East Coast Adventure? 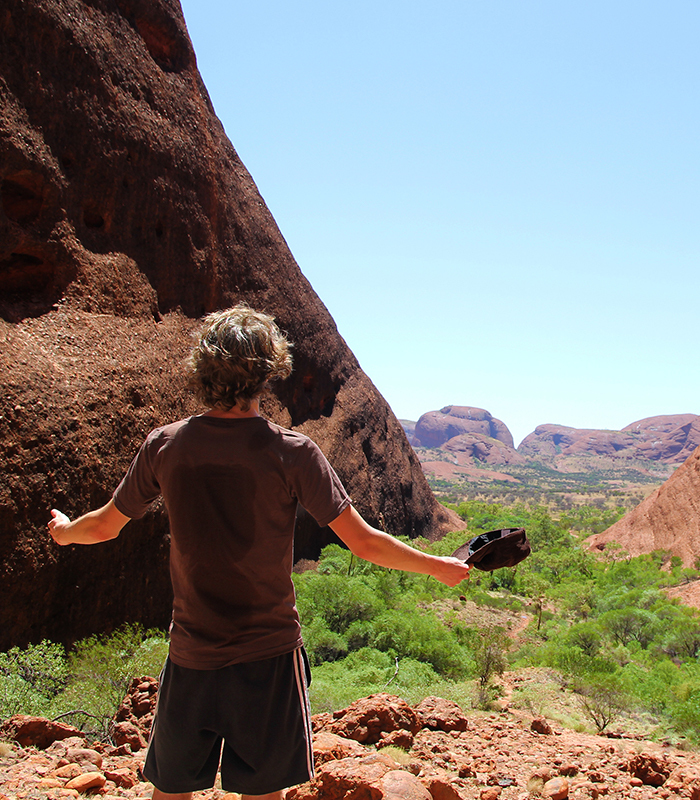 Get the real Aussie Outback experience with our Red Centre Outback add-on! 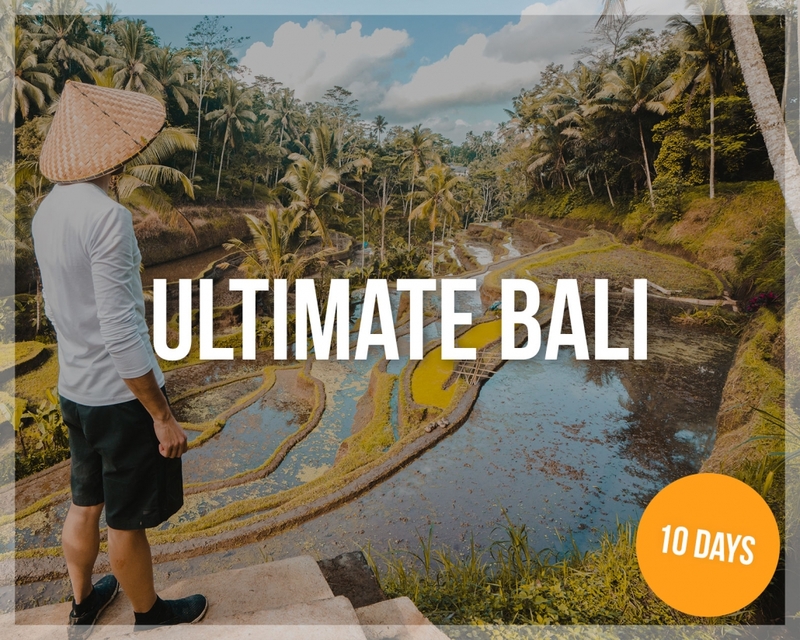 Ultimate Bali is fully guided by our awesome and experienced local Balinese guides, dedicated to showing you the best time and giving you an insight into Balinese culture. Your safety is our priority – our experienced guides are first aid-trained, available 24/7 whilst on tour and fluent in English and Indonesian. 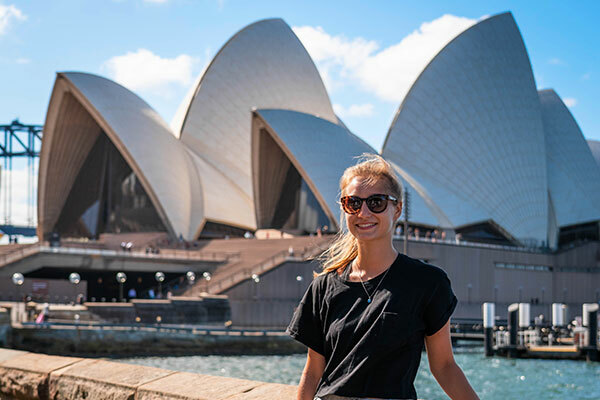 Day 1 – Welcome to Sydney! Your Aussie adventure kicks off in Sydney! When you land, our driver will take you directly to your accommodation – one of Sydney’s best backpacker hostels. Settle in and get ready for your epic adventure in the land down under! Today, join us at Ultimate HQ where you’ll meet the rest of your group. We’ll talk you through the plans for the next few weeks, answer any questions you have and introduce you to the crew. Next, we’ll take you on a guided city walk; think selfies in front of Sydney Opera House, lunch in Darling Harbour, lush Botanical Gardens and China Town. This evening we’ll take you to our favourite backpacker bar for our Welcome dinner. 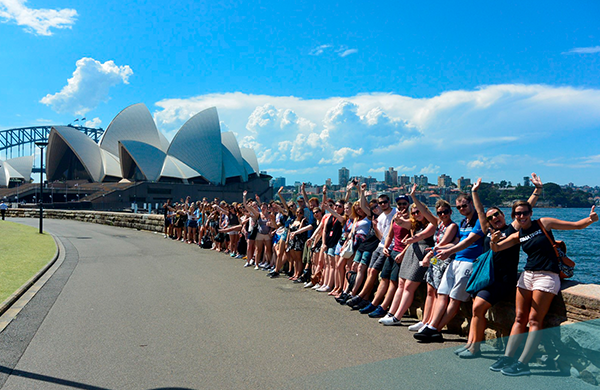 Today our East Coast Explorer tour kicks off in Sydney with a City Orientation tour. 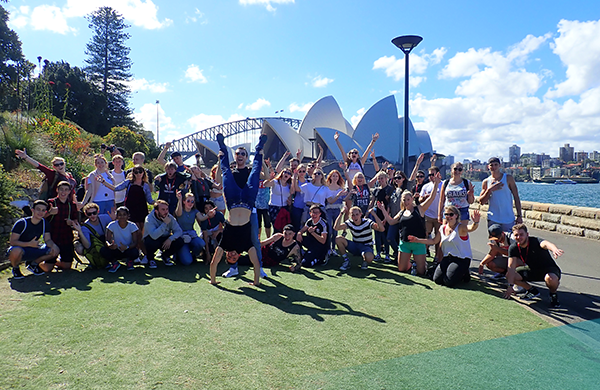 We will visit all of the cities famous landmarks and finish at the iconic Sydney Harbour Bridge and Opera House! Tonight, we depart the city on our journey up the East Coast. 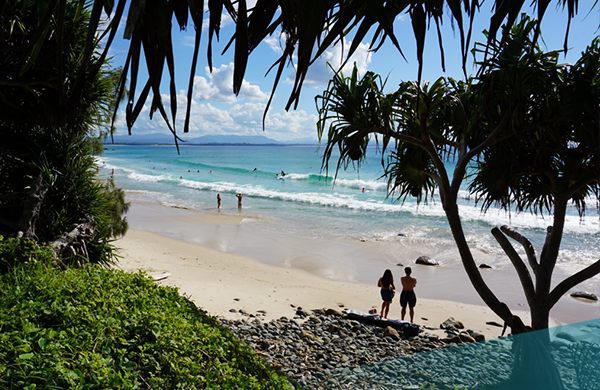 First stop, the vibrant Byron Bay. 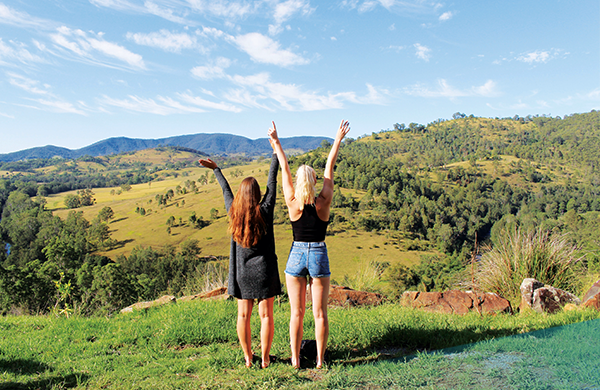 Today, our Ultimate East Coast adventure kicks off with a visit to the stunning Hunter Valley wine region for the backpackers dream – go wine tasting at one of Australia’s most famous vineyards! Then, we’ll head to Barrington Tops national park where you’ll stay in a private lodge overlooking the Barrington River surrounded by beautiful National park. Get your heart racing with some River Tubing or hiking, then enjoy a beer in the hot tub – the perfect way to start your East coast trip! Upon arrival, you’ll be greeted at the airport & driven directly to our modern surf inspired hotel. Meet the rest of your group & your Ultimate Bali guide for a group orientation and for the welcome dinner! After filling our bellies, we’ll explore some of Kuta’s best nightlife spots! 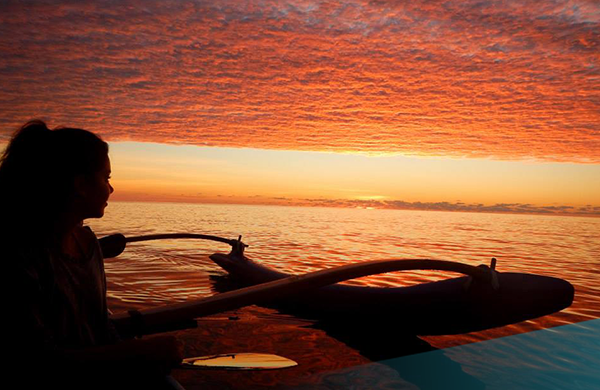 After settling into our beachfront Byron Bay home, we enjoy an afternoon learning about local history, Aboriginal culture and marine biology with an unforgettable kayak to Australia’s most Easterly point. Keep your eyes peeled for wildlife as we kayak through the marine park, home to bottlenose dolphins, humpback whales and various species of sea turtles. Tonight, we get to know our travel mates at our first group dinner. The next day, we’ll wake early and head to Byron Bay lighthouse in time for the sunrise. We’ll explore the area of Cape Byron by foot, taking in the incredible coastal views from the walking track then spend our final afternoon soaking up Byron’s unique vibes and exploring the town by bike. Today, we explore Sydney Harbour on our private catamaran! We’ll cruise under The Harbour Bridge and past the Opera House stopping off at one of Sydney’s hidden bays for a swim. 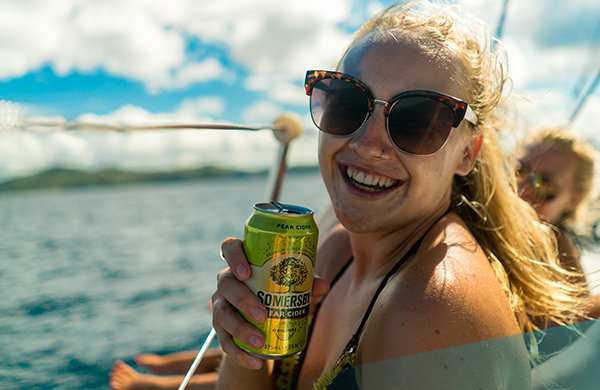 Enjoy your first Aussie BBQ, jump into the warm harbour waters and sip on a few chilled beers in the sunshine! What better way to spend your first two days in Sydney? 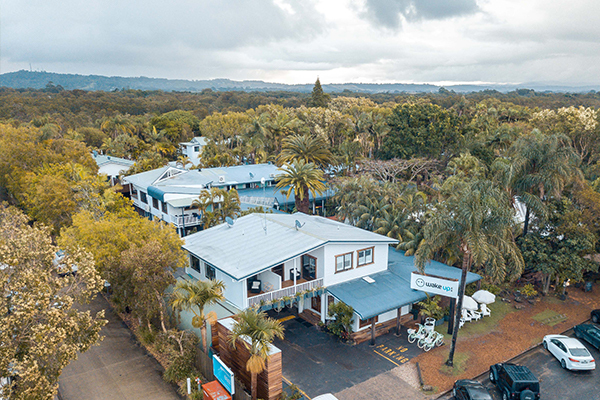 The next morning we stop off at the beautiful coastal town of Port Macquarie to visit the koala hospital and learn about how the hospital cares for and preserves these well loved animals. We’ll spend the night in the famous waterfront tipi dorms at Spot X – chill and soak up the sun on the private beach! 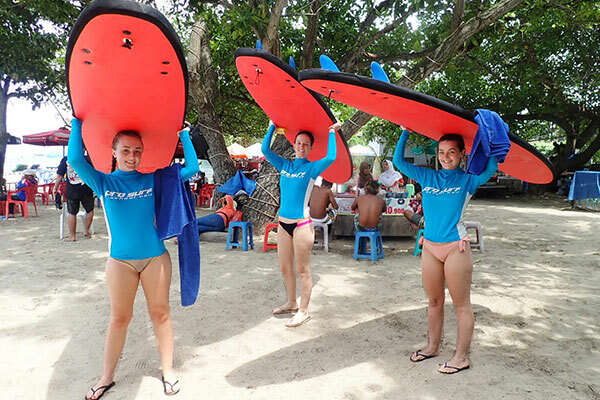 What better way to begin your Ultimate Bali adventure than by hitting the beach in Kuta and learning to surf! We’ll visit one of Bali’s best beginner surf beaches and learn how to ride the waves with the locals. After some free time in the afternoon to explore and shop the busy streets of Kuta, we’ll head to Seminyak for sunset on the beach & another fun night out on the town. 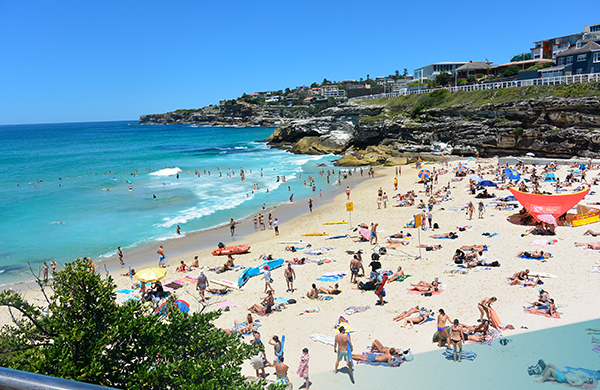 This morning, leave the city behind and head to the world famous shores of Bondi. 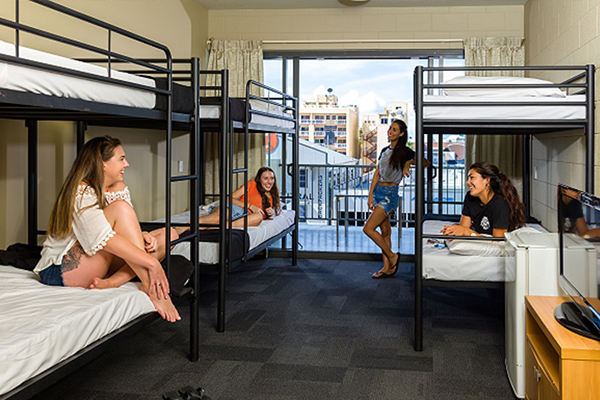 Your modern beach hostel is in prime position, overlooking Bondi beach. Watch the surfers, take a dip in the clear blue waters, spot ‘Bondi Rescue’s’ Lifeguards or take part in a yoga class on the rooftop of your hostel. This evening, enjoy a ‘cheese and wine night’ with new mates. 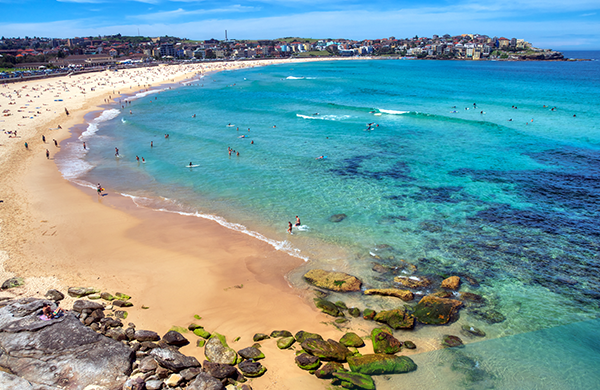 You’ll have two days here so unpack, unwind and soak up the beachy vibes of Bondi! This morning we arrive in Surfers Paradise where we’ll spend the next 2 nights! 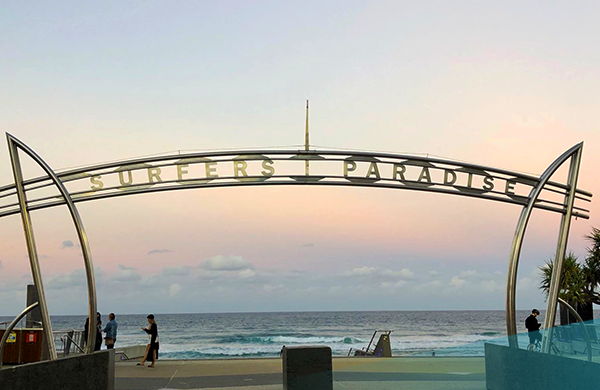 We spend the first afternoon exploring the golden sands of Surfers Paradise Beach and discover the endless entertainment of nightlife on offer! The next day, after a relaxing morning, we embrace the local way of life with a surf lesson – you’ll be riding the waves like a pro in no time! 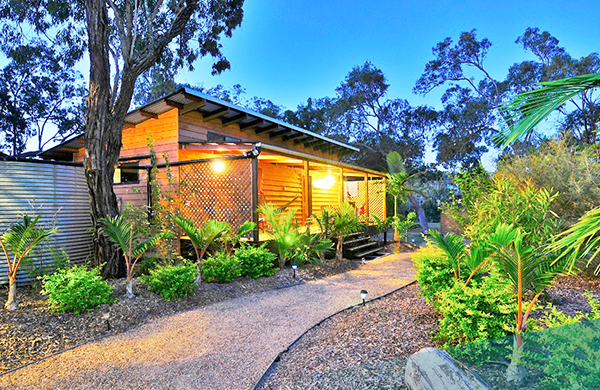 Today we travel off the beaten track and into Aussie bushland for our overnight River Retreat. We’ll kayak on the Nymboida river and spot wild platypuses. Choose to sleep under the stars in a swag (seasonal) or in our comfy cabins set on the river bank. 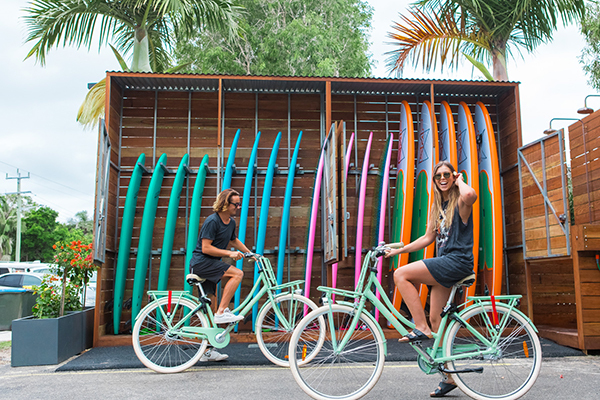 Escape the busy city and head to the chilled surf town of Canggu. Today we’ll visit Taman Ayun, one of the most beautiful temples on the island. 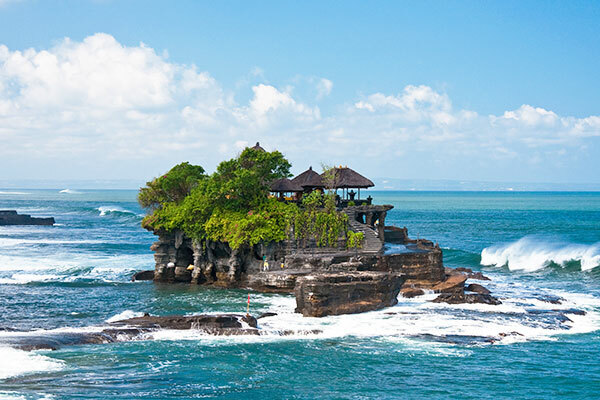 Next, we head to the Tabanan Region to visit Tanah Lot Temple which can only be reached by wading across low tide. Relax tonight by the rooftop pool where a Bintang (Bali’s famous local beer) will be waiting for you at sunset. 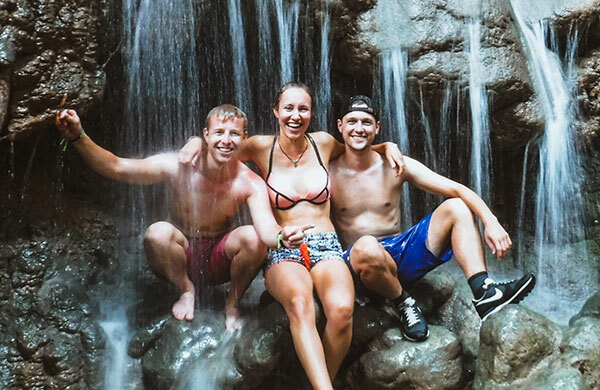 Today we will depart for Ubud, the place of “eat, pray & love.” En route, we’ll stop off to explore the hidden waterfall of Tegenungan – absolutely stunning! 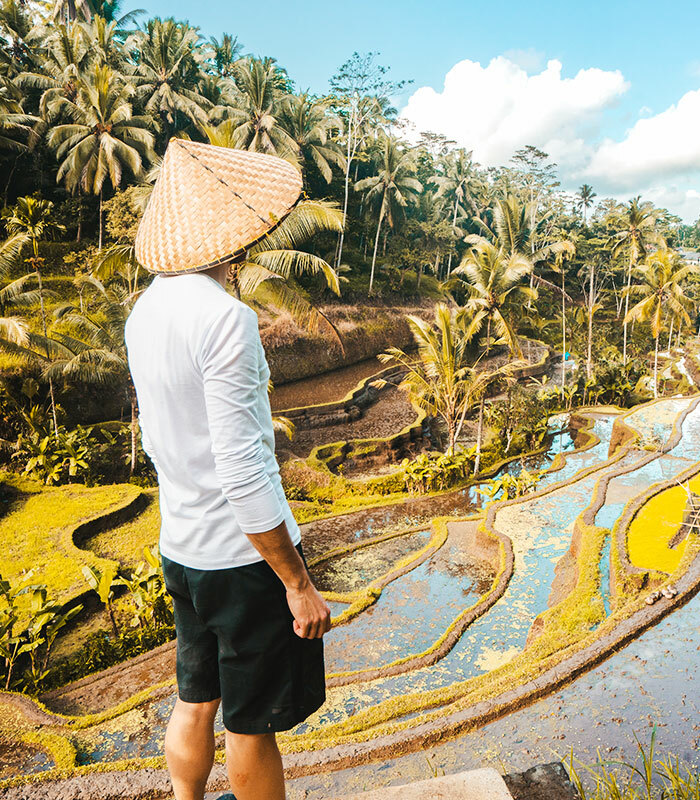 Continuing on we’ll make a short stop to explore the Tegalalang Rice Terraces by foot and lastly meet some of Ubud’s cheeky inhabitants at Monkey Forest. This morning join an optional surf lesson in Bondi (add-on) or check out the boutique shops in Bondi’s laneways before washing the sand off your feet and heading back to the city. Spend the next day chilling, take a stroll over the top of The Harbour Bridge, hop on a ferry to Manly or join a day trip to The Blue Mountains (add-on) This evening, get ready for the Ultimate party night! We’ll take you on a pub crawl of the best backpacker bars and clubs in Sydney. 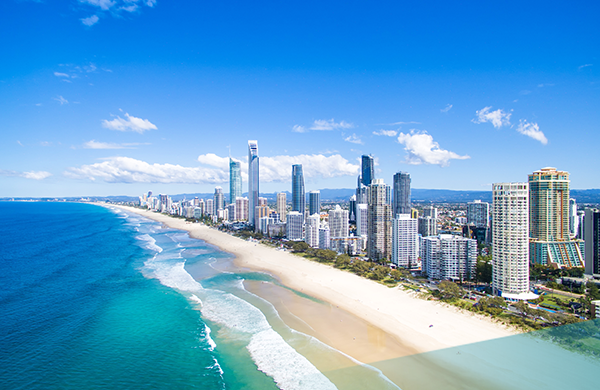 We continue our travels up the coast to Brisbane, the capital of the Queensland state. We spend our first day exploring the Southbank cultural precinct of the city featuring man-made Streets Beach (outdoor swimming pool! ), walking tracks and picnic areas. Our second day is spent at the home of the crocodile hunter, Australia Zoo! We’ll spend the day learning about the conservation efforts of the famous Irwin family and getting up close to a variety of native Australian wildlife including kangaroos, koalas and wombats! 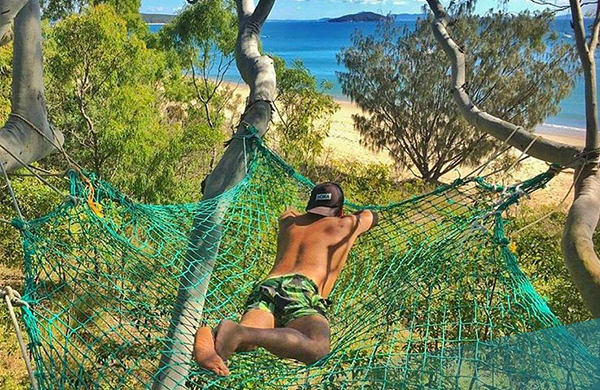 Chill for 4 days at the beach paradise of Byron Bay, famous for its awesome beaches and laid back surf lifestyle. 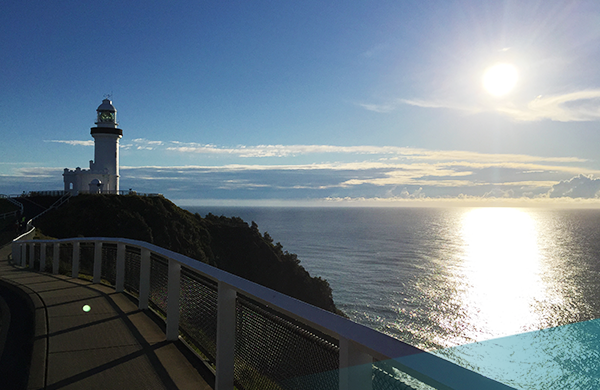 The Byron Bay lighthouse, located at the most Easterley point of Australia is a must- see in Byron. Walk there for an unmissable sunrise! GET READY FOR YOUR FRASER ADVENTURE! Today we arrive into Hervey Bay, the gateway to the World’s largest sand island. We settle into our accommodation for the night and get ready for an exciting few days ahead on stunning Fraser Island. There’s no better way to shake off last night’s hangover than with some fresh sea air! After a little lie-in, we’ll take you on the famous Coogee to Bondi coastal walk, stopping off at five stunning beaches and coves along the way. Just another reason to fall in love with Sydney! 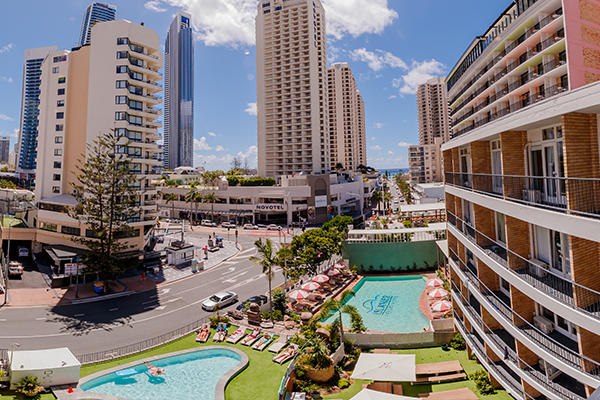 You’ll be staying at the biggest and best hostel in the heart of Surfers Paradise – the party mecca of the Gold Coast! 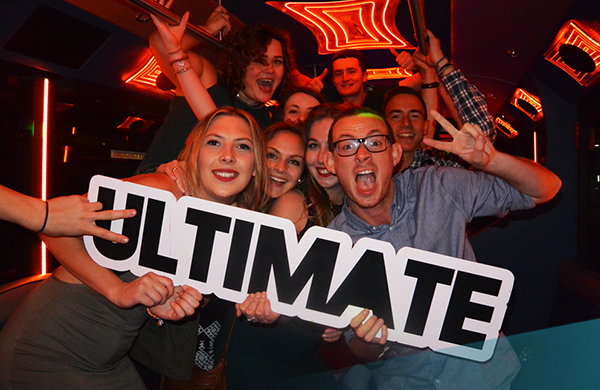 If you love beaching it up, crazy night life and theme parks, you’re definitely in the right spot! 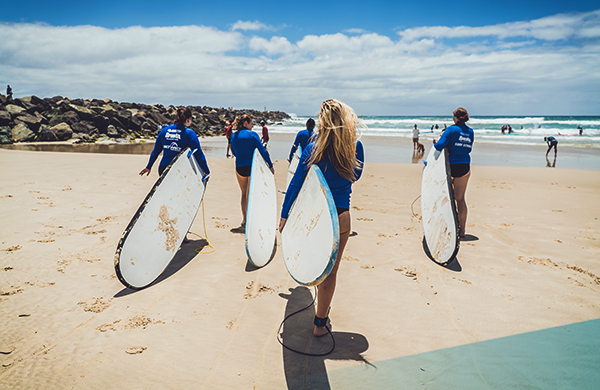 With amazing beaches and beautiful weather Surfers Paradise is also the perfect place to learn to surf. 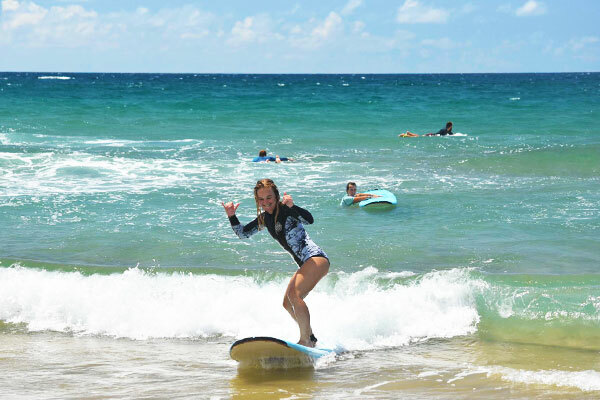 Enjoy a two hour surf lesson on one of the Goldy’s best beginner beaches and ride the waves like a pro! Feeling adventurous or looking for some rest and relaxation instead? Today you have 2 options. 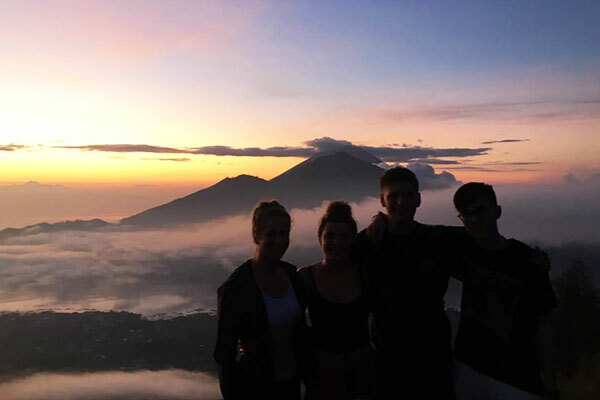 Choose to rise early and trek the active volcano, Mt. Batur. When you reach the summit relax your legs and take in an unforgettable sunrise! Prefer to sleep in? Take part in a mindful yoga class followed by an hour long Balinese massage. The choice is yours! The afternoon is yours to spend as you choose. Zen by the pool, wander around the local markets, try some of the organic delicacies and take in the magical feel of Ubud! The next three days are spent exploring world famous Fraser Island. We’ll swim the crystal waters, discover secret lakes, explore the Maheno shipwreck and hike to island lookouts for stunning panoramic views across the island. 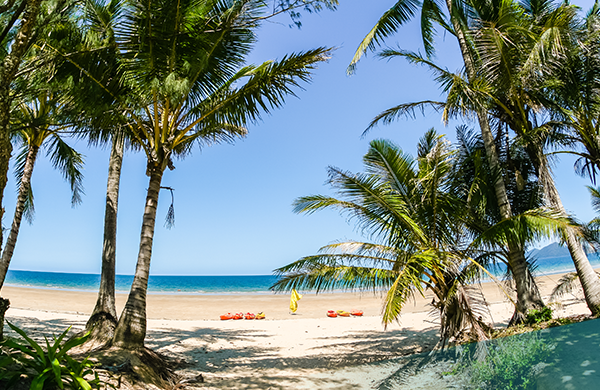 On our third day of island paradise, we return to Hervey Bay ready for the next part of our adventure. 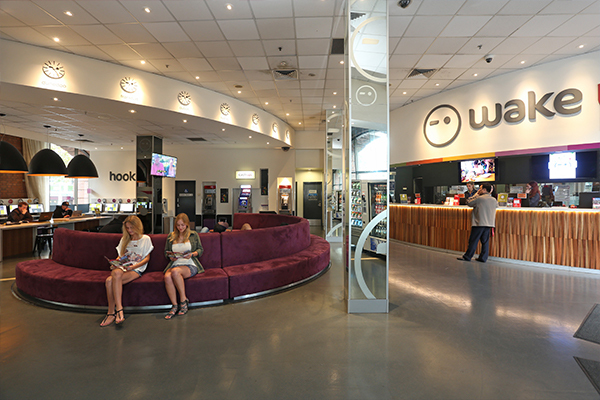 You will be staying at an awesome hostel located in the heart of the cafe, cultural and nightlife scene of Brisbane. 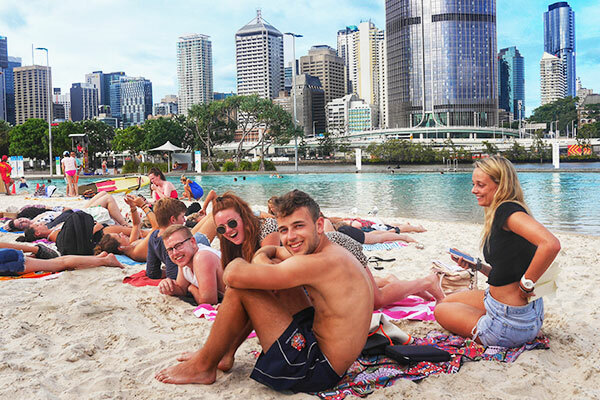 Make sure to check out Streets Beach, an awesome public beach on the South Bank of Brisbane River! After breakfast, we’ll head to the harbour and hop on the fast boat to Gili Trawangan, the largest and most popular of the Gili Islands and also every traveller’s favourite spot! 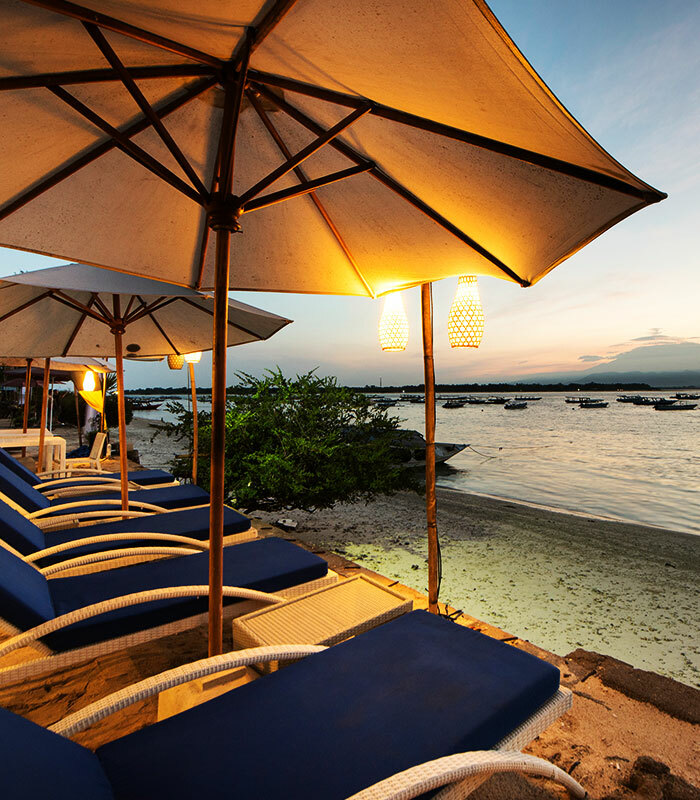 Upon arrival, we’ll check-in at one of Gili T’s best hostels and later meet to catch the sunset and drink to our arrival in paradise! 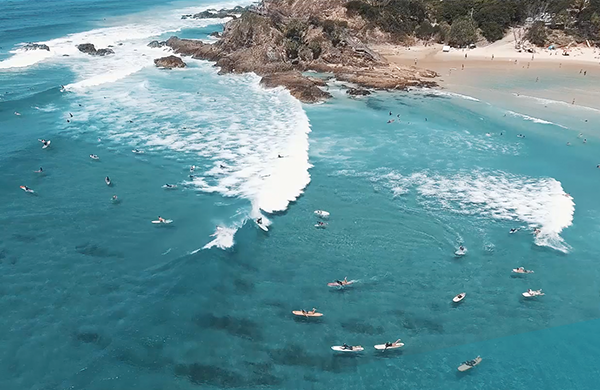 Byron Bay is famous for it’s amazing beaches, laid-back-surfer attitude and boho vibes. 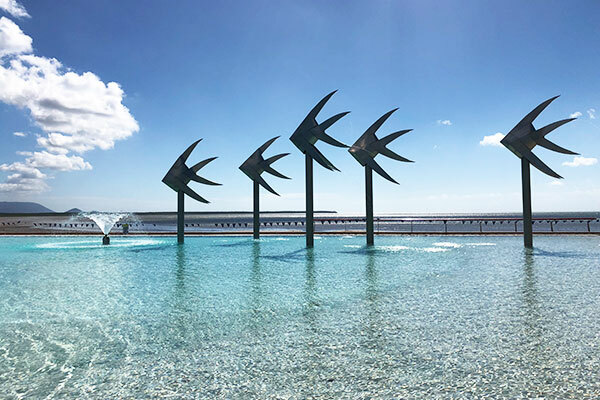 Here we’ll explore the relaxed town and some of the many beautiful beaches in the area as well as the famous Byron Lighthouse, standing at the most easterly point of the Australian mainland, at sunrise. 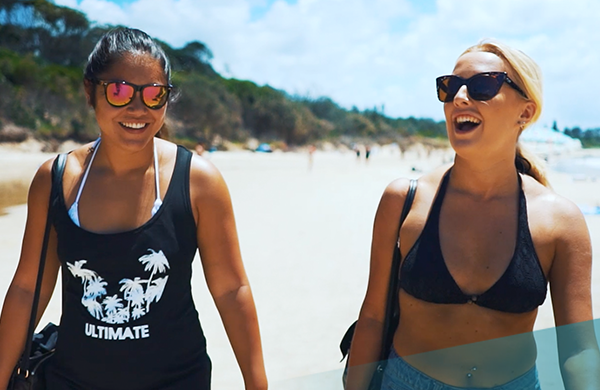 Embrace the surfer vibes of Byron with a professional surf lesson. Keen for more? Get up close with friendly wild dolphins on a dolphin kayaking tour or check out the alternative hippie hub of Nimbin (add-ons). 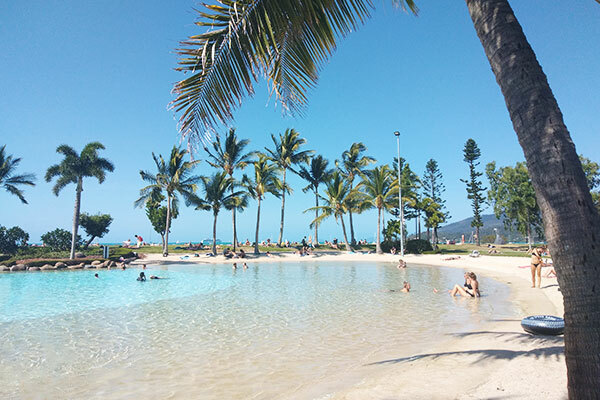 We continue our journey to Airlie Beach, home to the Whitsundays Islands. 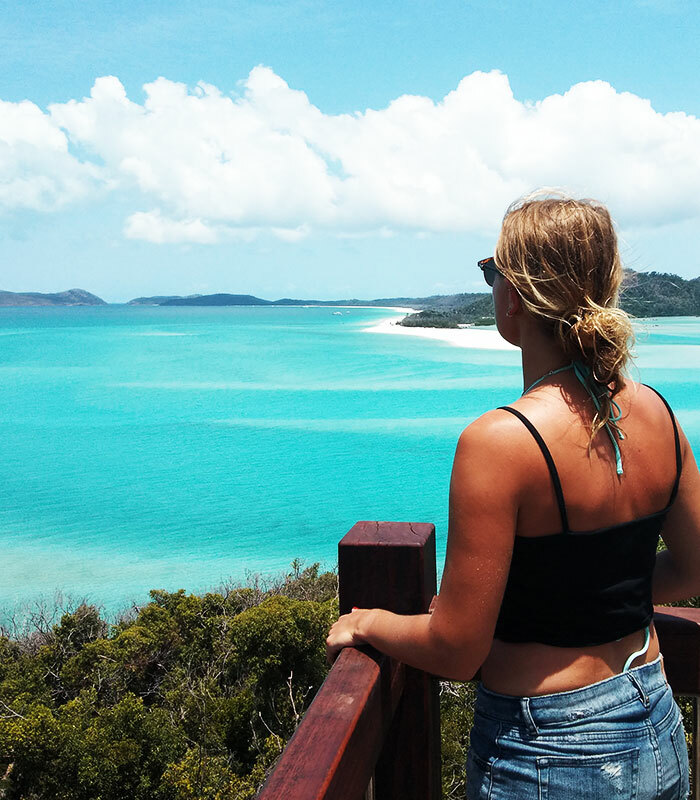 We settle into the vibrant coastal town before boarding our sailing boat for a two night sailing adventure exploring some of the 74 islands that make up the Whitsundays! 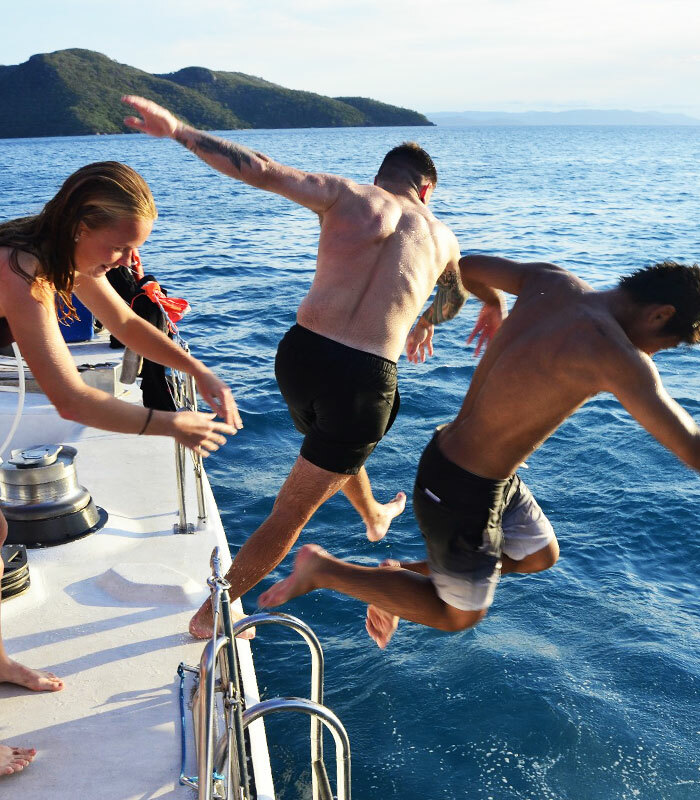 Here you will be treated to the perfect mixture of adventure and relaxation; Take it easy on deck while you sail around the islands, stopping off to snorkel, swim and explore the world famous Whitehaven beach. 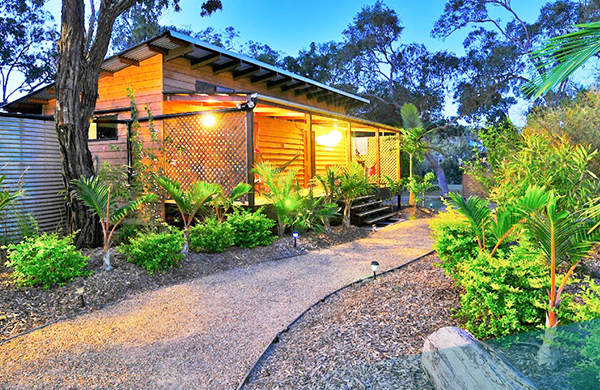 Enjoy 2 nights in paradise at Noosa on the Sunshine Coast. Your accommodation is surrounded by lush tropical gardens with direct access to the resort pool. Today we explore the island by bicycle. 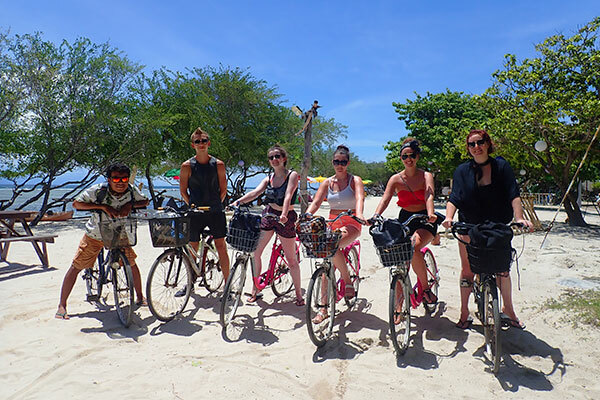 Enjoy the ride and stop at some of Gili’s most picturesque spots for some great photo opps! Remember, you’re on island time so r-e-l-a-x! 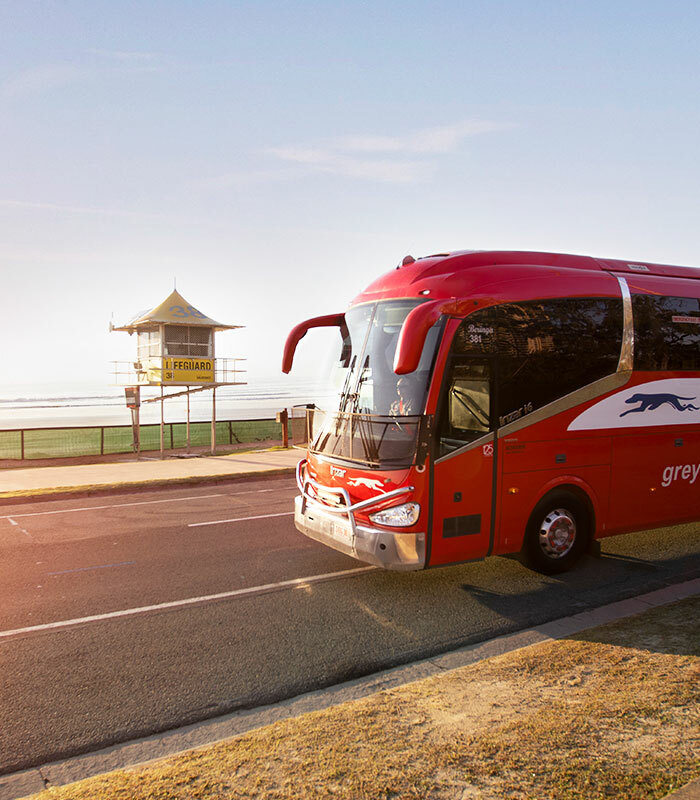 This morning, we’ll hop on the bus to Surfers Paradise: where long stretches of stunning sandy beaches meet high rise buildings and never-ending nightlife! By day we’ll explore the town and beaches and at night, we’ll make the most of the nightlife! Get dressed up and join our optional party night (add-on) for the real Surfers experience! Join a stand up paddleboarding session (add-on) or if you love theme parks, your tour guide can also help you organise a visit Dreamworld, The Gold Coast’s most famous theme park (optional add-on). 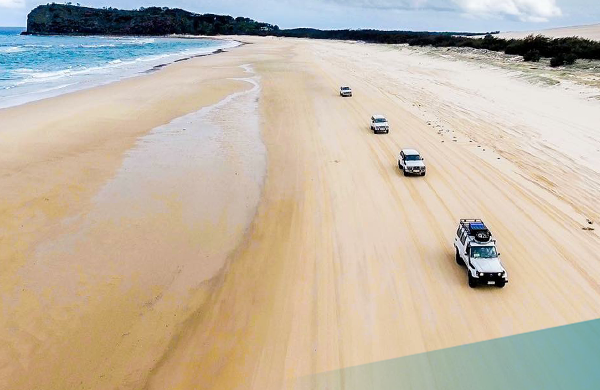 It’s time to head to Rainbow Beach, the gateway to World Heritage Fraser Island. 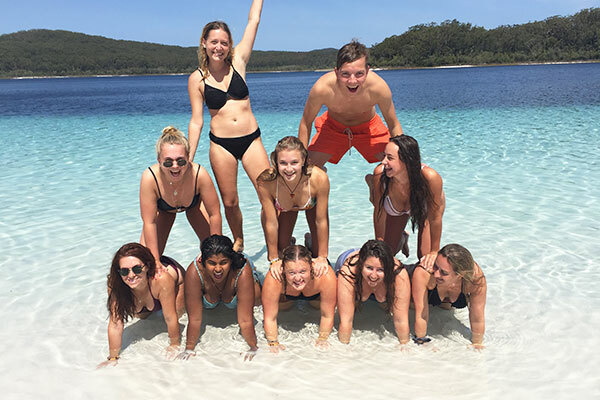 Check out the beach, enjoy a guided bushwalk, relax at your hostel with a BBQ and get ready for your Fraser Island adventure! It’s time to head back to land! Our afternoon is spent in Airlie Beach, chilling by the Harbourfront lagoon, wandering around the local shops and checking out some of the great backpacker bars. You can’t visit Gili T without snorkelling so today we’re cruising the islands! 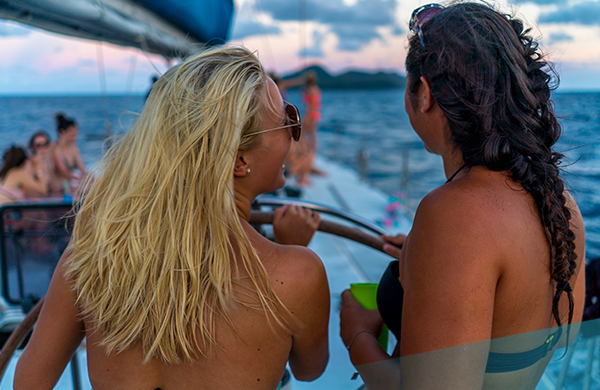 We’ll explore each of the three Gili Islands on our own private pontoon, stopping off along the way to snorkel in crystal clear waters and swim with sea turtles right off the shore. Explore the reef, walk on the white sandy beaches and take in your surroundings – we are in paradise! Tonight is the last night of our tour, so let’s celebrate with a traditional BBQ on the boat for sunset & after our return, we can celebrate all that we’ve done with a few bevvies! After a short journey North of the Gold Coast, we’ll arrive at our Brisbane accommodation, right in the city centre. 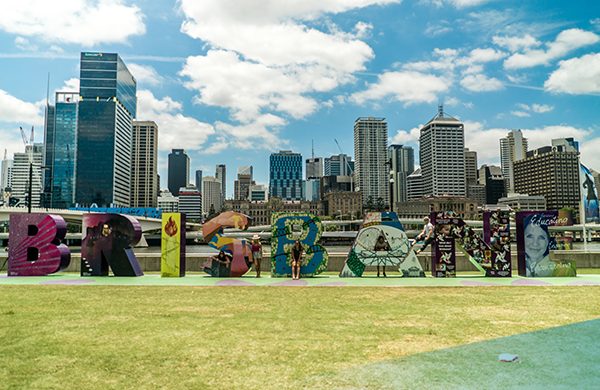 We’ll spend the next two days checking out some of Brisbane’s hotspots including Street’s Beach (Brisbane’s man-made city lagoon), Brisbane River and the cultural hub of the South bank. 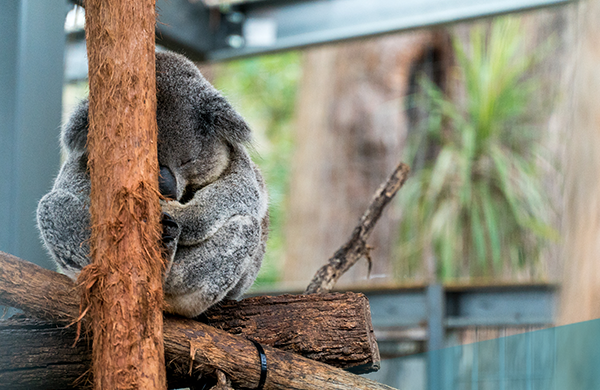 You’ll also have the option to head to the famous Australia Zoo to see some amazing wildlife! (add-on). 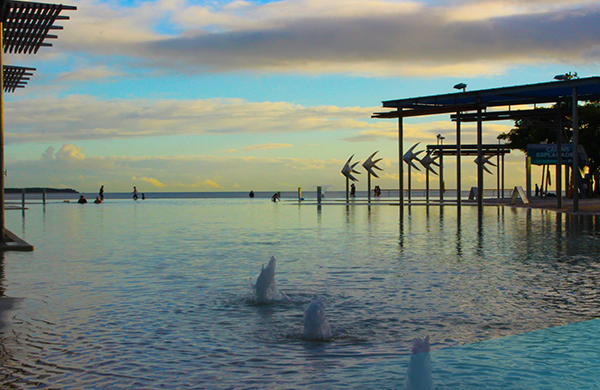 The final stop on our journey is Cairns, the gateway to the Great Barrier Reef and the adventure capital of Australia! Check into our resort-style accommodation, chill by the pool and settle in ready for an awesome few days ahead! Explore the world’s largest sand island by 4WD! Over 3 days, drive on the beach, swim in Australia’s clearest fresh water lakes, check out the Maheno shipwreck and hike to Indian heads lookout for stunning panoramic views across the island. We’ll spend our evenings at our private campsite right near the beach. We then return to the mainland and check back into our hostel in Rainbow beach for the night. 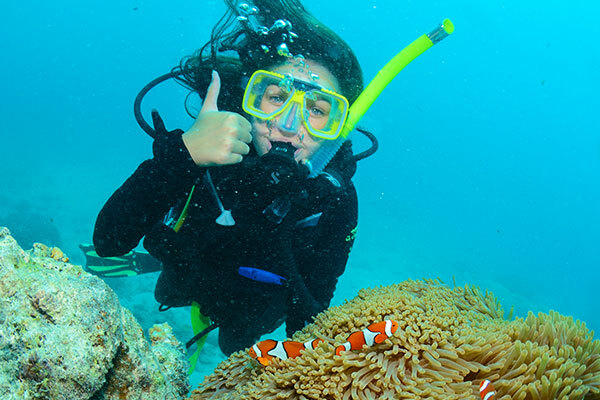 Discover UNESCO World Heritage Great Barrier Reef on our snorkel day trip of the outer reef. Encounter marine life such as turtles, stingrays and clownfish at the best snorkel spots, enjoy a buffet lunch onboard and learn all about the areas diverse reef. It’s time for us to say our good-byes. 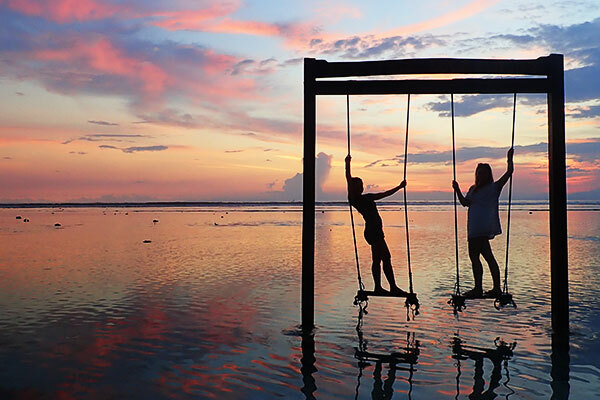 Whether your plan is to return to Kuta, continue your stay in Gili T or join another Ultimate tour, we’re here to help you with your onward travels! 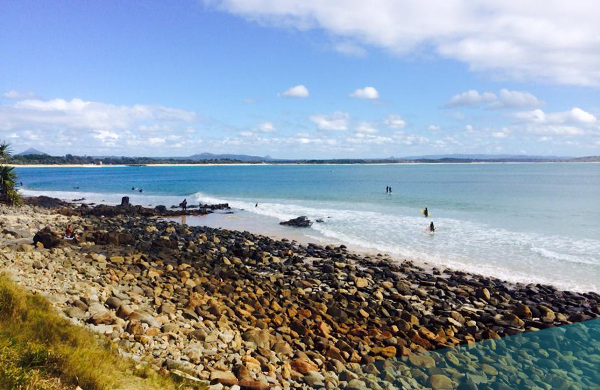 If being surrounded by tropical greenery and beautiful beaches is your cup of tea, you’ll love Noosa! 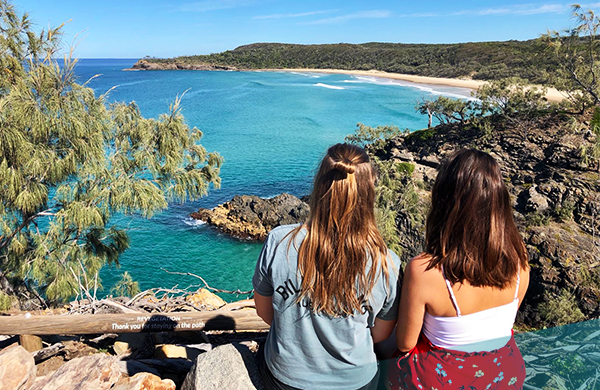 We’ll hike through National Park to lookouts boasting incredible views over Noosa’s spectacular coastline, stopping off to spot amazing Australian wildlife along the way. Your hostel has it all; chill by the resort pool or enjoy a few cold ones at the bar. Anyone fancy a game of beer pong? Next, explore the coastal town of Emu Park. Spend the afternoon relaxing by the resort pool or go turtle spotting. Upgrade to ‘Treasure Island’ for an unforgettable experience in the Southern Great Barrier Reef – swim with turtles, explore some of the islands 17 white sandy beaches, work your way through treasure hunt clues & more! This evening, we’ll hop on the train for our overnight journey, waking up in Airlie Beach. During our time in Cairns you’ll have the opportunity to customise your experience and add some additional activities to your adventure. 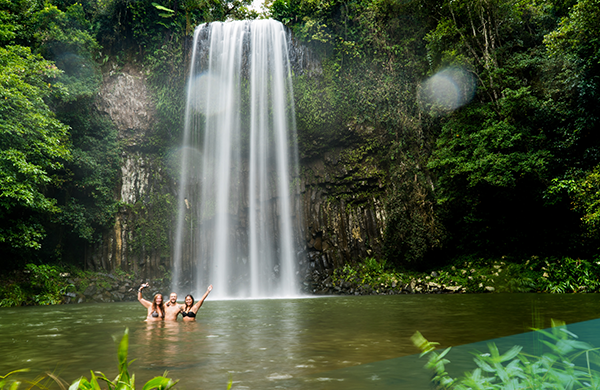 From Skydiving and Bungy Jumps to White Water Rafting and Rainforest Tours, Cairns has endless adventures on offer! On our final night in this North Queensland paradise we say farewell with a group dinner. Ultimate and your group leader will be available to help you plan your ongoing adventures and travels. This morning, we arrive at Rainbow beach, the gateway to Fraser Island. 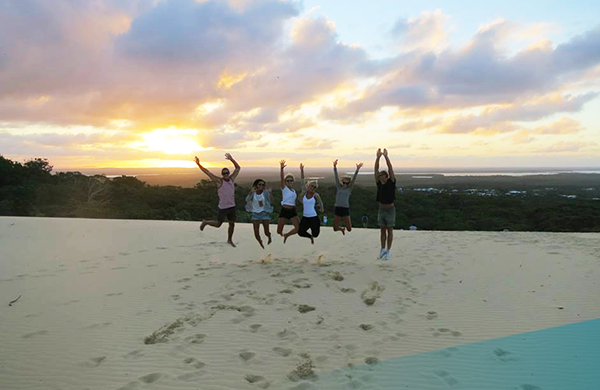 We’ll check into our hostel and head out for a short hike to Carlo Sand Blow, a unique sand mass where you can watch the sunset over the southern tip of Fraser Island! Here you’ll get the opportunity to view the resident pod of wild dolphins as they feed. You can also choose to buy some fish ($5) and enter the knee deep water in the marina to feed the dolphins. The rest of the day is yours to chill on the beach, explore Rainbow or relax at the hostel. 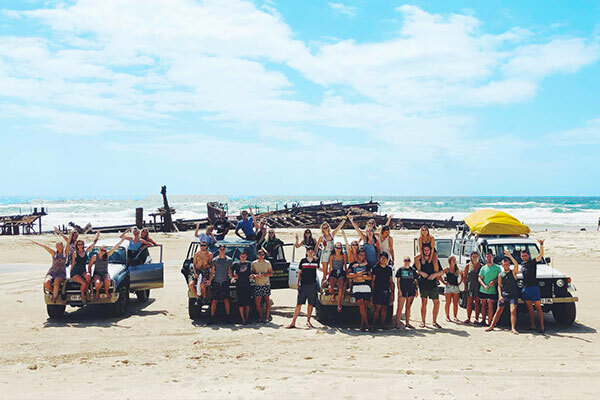 This evening you’ll receive a safety briefing at our hostel, ready for your Fraser Island adventure the following day! 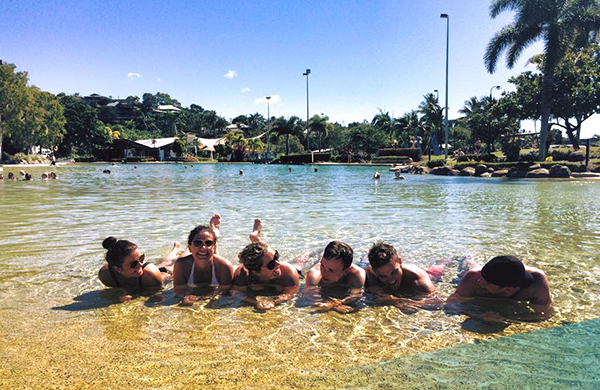 Airlie Beach is one of the East Coast’s best party towns, with awesome bars and nightlife. 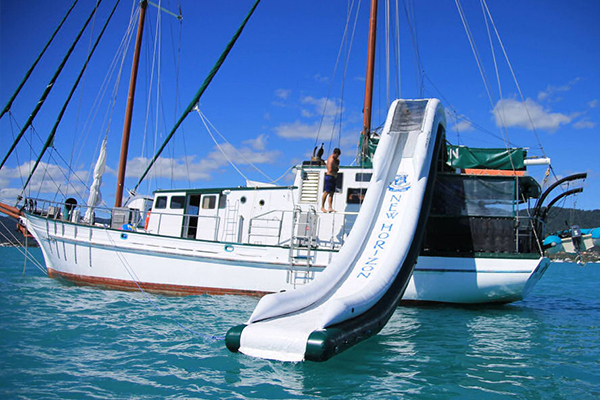 Spend a night here hanging out with the locals and get ready for your Whitsundays Sailing trip! 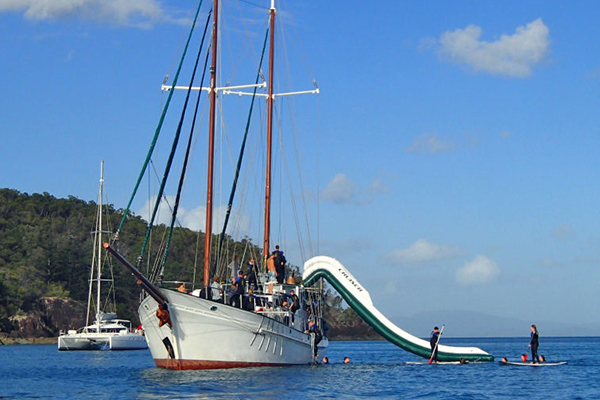 Then spend two awesome days and nights sailing around the Whitsunday Islands and snorkelling the crystal clear waters. 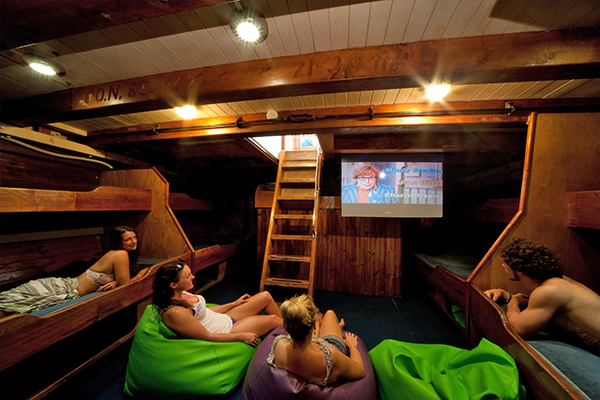 Sleep on the boat, enjoy amazing freshly prepared food and relax & sunbathe on deck! 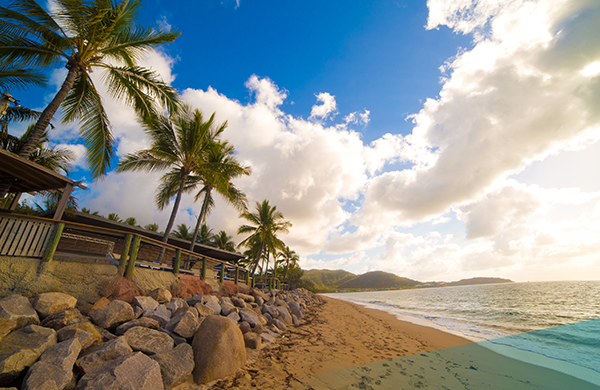 After you’ve explored the stunning Whitsunday Islands, return to Airlie beach for 2 nights. 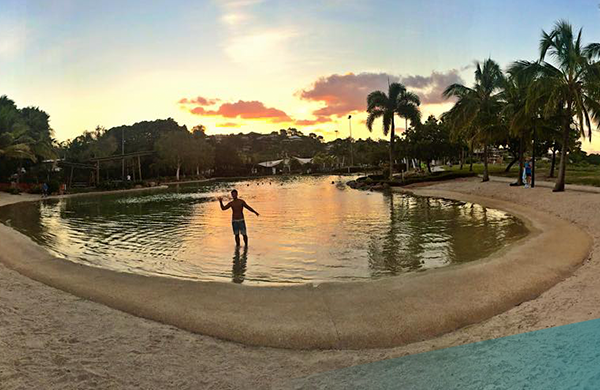 Wander around the town, go for a swim in Airlie’s famous harbourfront lagoon and soak up the tropical paradise vibes of Airlie beach! 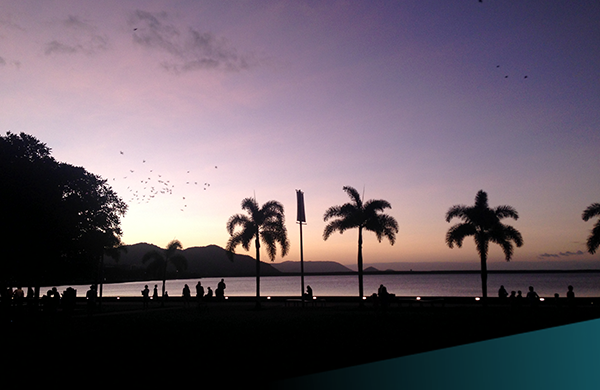 This evening, we arrive in the small coastal town of 1770, named after the second landing sight of Captain James Cook. We’ll check in to our accommodation, spark up the barbie and gather around the fire pit. Keen to explore the area? Join 1770’s famous scooter tour of the town; get tattooed up, put on a leather flame jacket and channel your inner biker (add-on). This evening, we’ll hop on the bus, waking up in Airlie Beach! 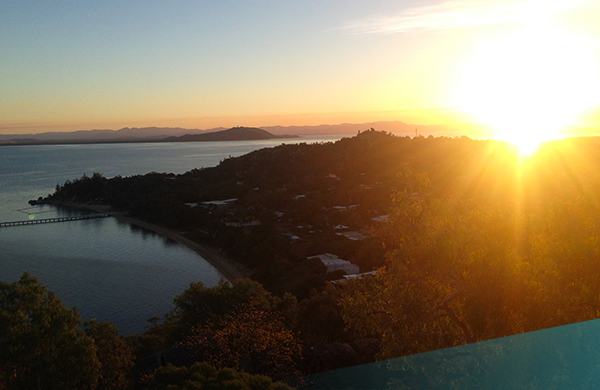 Magnetic Island will blow you away with its golden sandy beaches, amazing Aussie wildlife and incredible views! Take in the stunning scenery on the Forts walk and chill on the beach with your new mates! Today we arrive in Airlie Beach, the gateway to the Whitsunday Islands! We’ll check into our hostel in the centre of town and check out the harbourfront. Soak up the atmosphere – we’re in paradise! Our next few days will be spent sailing around the Whitsunday Islands. We’ll snorkel in pristine blue waters, getting up close with an abundance of tropical fish and visit some of the whitest sandy beaches in the world. The views here are breathtaking! Our home for the next few days is a Maxi Sailing yacht, where we’ll eat delicious food, party and sleep in comfortable beds below deck (or under the stars!) – it doesn’t get any better than this! 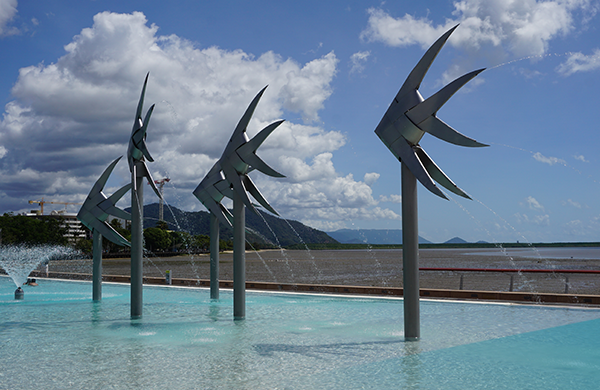 Cairns is the adventure capital of Australia! 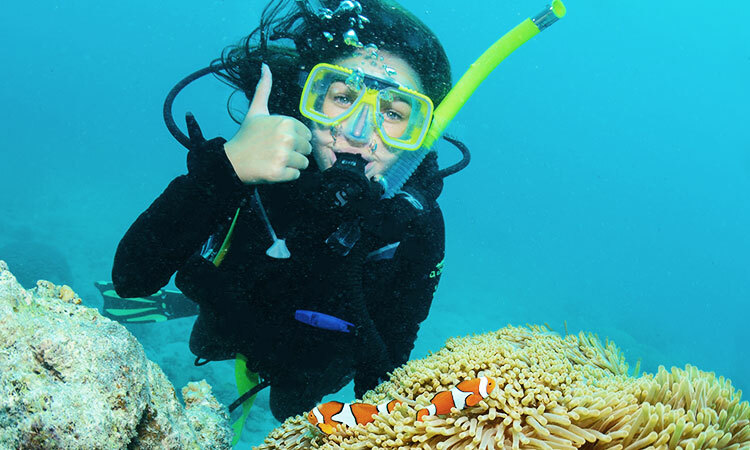 Whether it’s skydiving, scuba diving, snorkelling, white water rafting, sea kayaking, bungy jumping or exploring the Great Barrier Reef, Cairns will not let you down! You’ll be here for 4 nights, so plenty of time to get the adrenaline pumping! 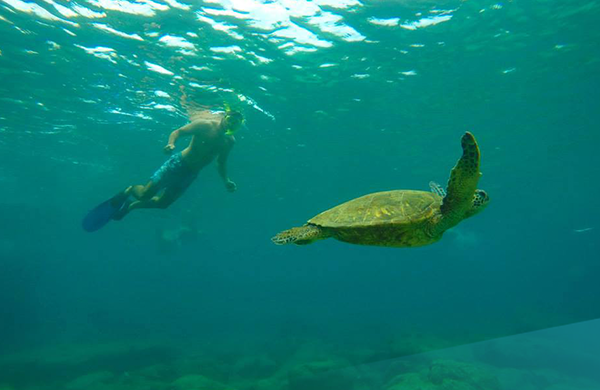 Experience an amazing day snorkelling on the Great Barrier Reef, the world’s largest coral reef system. Meet turtles, sea cucumbers and try to find Nemo! $20 Reef Conservation Tax to pay on arrival. Just a short ferry crossing from Townsville, we’ll arrive in Maggie island, a gorgeous tropical haven with heaps to see and do! Explore the many bays and golden sandy beaches, snorkel the pristine island waters, take the guided Fort’s walk offering incredible views of the island and come up close with koalas and wallabies at our hostels on-site wildlife park (add-on). In the evening, we’ll enjoy a few drinks and games at our hostel bar. Feeling adventurous? 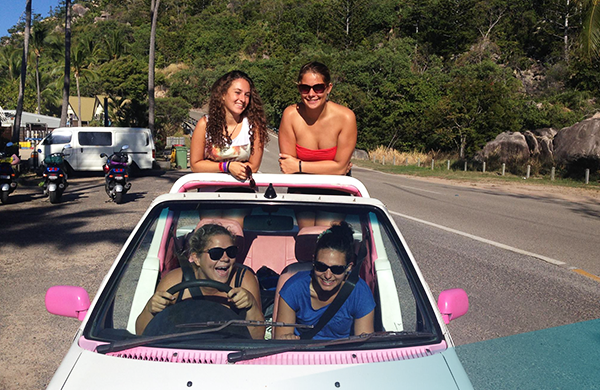 Take your new mates on a tour of the island in a 4WD ‘barbie’ car (available for daily hire). The photo opportunities are endless! 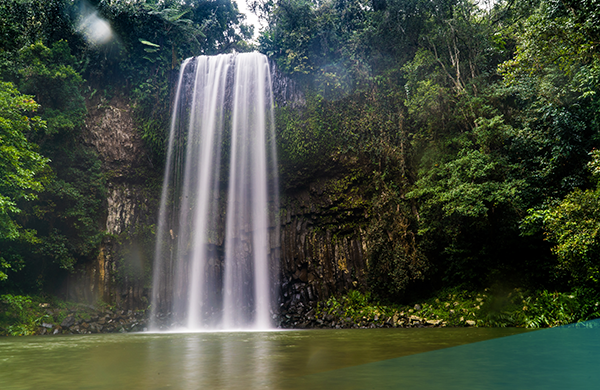 Today, experience the highlights of the Atherton Tablelands; a tropical rainforest located west of Cairns! You get to swim in a volcanic crater lake and play in fairy-tale like waterfalls on a fun, fresh & laid-back tour! A great day with stunning scenery guaranteed! This afternoon we leave Magnetic Island and travel to the beautiful beachside town of Mission beach where the reef and rainforest meet. The sunrise here in Tropical North Queensland is magical! This morning we recommend hiking into the neighbouring National Park, part of the traditional country of The Djiru Aboriginal people. Feeling adventurous? You have the option of joining our awesome white water rafting adventure in Tully, just a short distance from Mission Beach! (add-on). Mission beach is also home to Australia’s highest (15,000ft!) and most popular skydiving spot – an experience not to be missed for the adrenaline junkies out there! You’ll get the chance to do a skydive the following morning, before we travel on to Cairns. Pre-book your skydive (add-on) or arrange with the help of your guide as you travel, no worries! If you would like to make any changes to your trip, simply let us know. 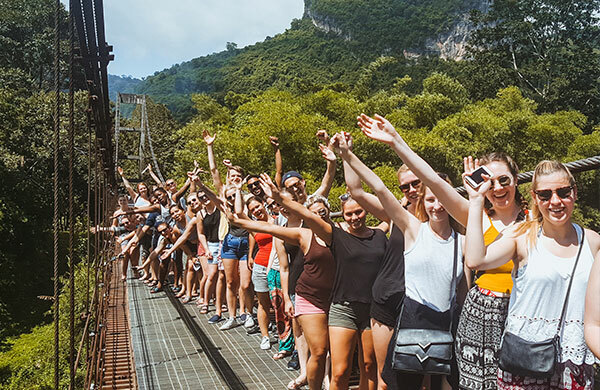 We can add extra accommodation, skydives, white water rafting trips, bungy jumps and much more; we will make sure you’ll get to tick everything off your Aussie bucket list! This evening we arrive in Cairns, our final stop along the East Coast and the Ultimate backpacker destination – you are in for a treat! 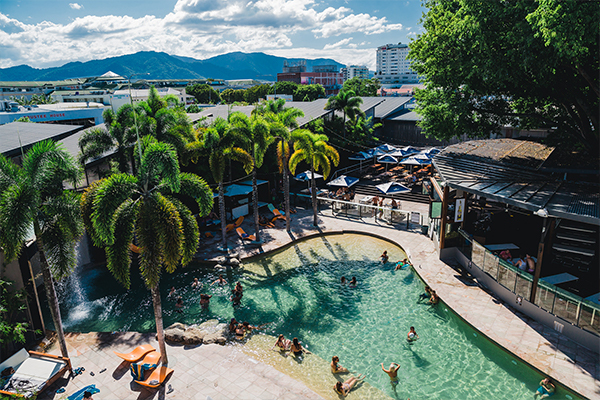 Our resort style accommodation is one of the best in Cairns, with luxury air conditioned en-suite dorm rooms, a huge pool and daily entertainment. Sit back, relax, and prepare for the next few exciting days! Keen to see more? Explore the rainforest on our Cape Tribulation add-ons! 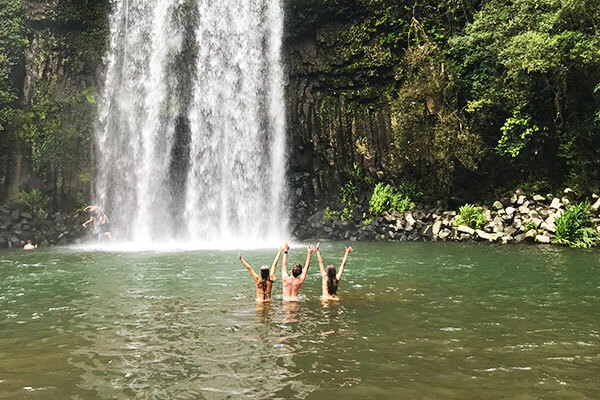 Our first adventure in Cairns takes us to the Tablelands region where we’ll spend the day swimming under waterfalls, sliding down natural rock slides and spotting shy platypuses in the wild. The next day, we explore the famous Great Barrier Reef. We’ll cruise to the outer reef to snorkel with inquisitive Nemos, stingrays, turtles and friendly Maori Wrasse and learn all about the diverse marinelife of the reef. 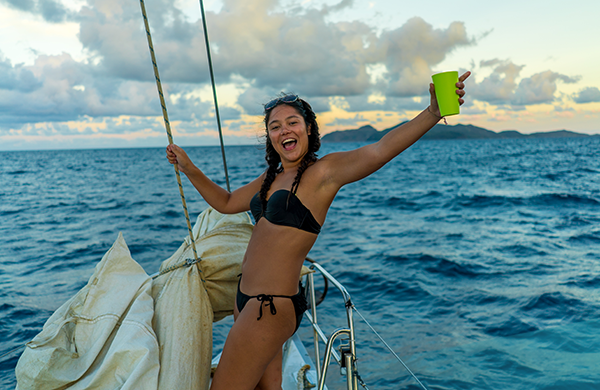 When we’re not exploring the rainforest and reef, we’ll hang out at Cairn’s famous harbourfront lagoon, hit the local bars and party the night away at our hostel’s very own club! On our last evening we’ll take you to our favourite spot to reflect on an epic 6 weeks of Aussie East Coast fun!